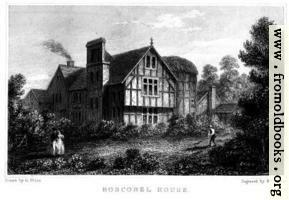 This is the house that sheltered King Charles II after the battle of Worcester. Drawn by G. Price. Engraved by Mc. Gahey. Published by J. Mason, 14 City Road. 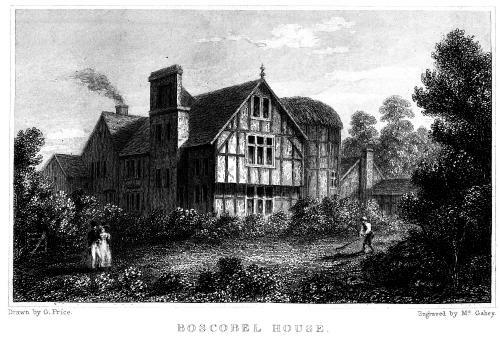 BBC page about Boscobel House includes pictures. The house was built in the 1630s, and today is operated by English Heritage. This building, rendered remarkable in English history, as having afforded an asylum to King Charles the Second, after the fatal battle of Worcester, is situated at a short distance from the village of Tonge, in Shropshire, but on the border of Staffordshire. The end and back part of the house remain nearly in the same state as when the King took refuge in it; but some of the other parts have been much altered, particularly an out-building converted into a sitting parlour, the principal entrance removed, and the area of unenclosed land in front of the house laid out with taste, as a pleasure ground. The interior has also been much altered; but whatever could be traced relative to the King’s concealment has been preserved with care. 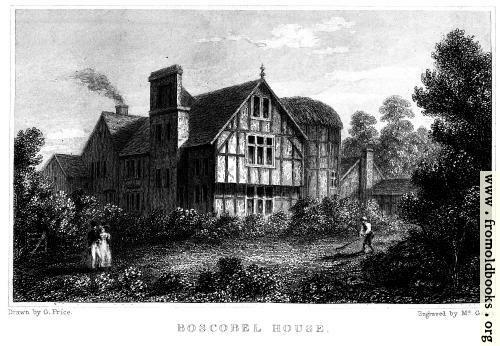 The places in which he was hidden are chiefly in, and adjoining to, a large chimney: the garret, or, as it is termed, the gallery, entered by a trap-door, was probably one of them. From this there is a descent by a step-ladder to the next hiding-place, and from thence to a door near the bottom of the chimney that leads to the garden. The large wainscoted parlour is nearly in its original form. The place of concealment behind the wainscot has long been stopped up; and the gloves and garters, said to have been left by the King, were lost before the present possessor came to the house.